Category Archives: "Quivertree Forest and Giant’s Playground"
The friendly Canyon Hotel, conveniently situated in Keetmanshoop, offers a taste of typical Namibia hospitality. The hotel is fully air-conditioned and each of its 70 rooms is equipped with a private bathroom, TV, radio, telephone, coffee machine and wall-to-wall carpeting. Other facilities include a gym, a swimming pool and conference facilities for up to 100 delegates. The Canyon Hotel is the ideal base for visits to the Naute Dam, the farm Spitskop Ost with its mesoaurus fossils, the Giant’s Playground, as well as the kokerboom (quiver-tree) forest, where visitors can view a rare cluster of the unique Aloe Dichotoma. 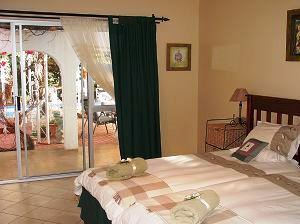 Relax in a quiet family atmosphere in this cozy B&B in the heart of Keetmanshoop. All 5 bedrooms are spacious and have an en-suite bathroom, remote controlled air-conditioning and television. Amenities offered are a beautiful, shady garden with sparkling swimming pool, guest lounge; secure parking. 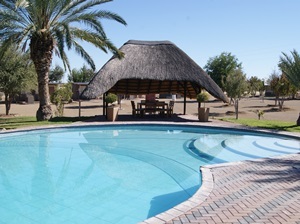 Maritz Country Lodge, only 5 km south of Keetmanshoop, is closely situated to all major tourist destinations such as the Quiver Tree Forest and the Fishriver Canyon. 12 bungalows that can accommodate from one person up to six persons. These bungalows includes bedding, fridge, air conditioner or water cooler, television, necessarily cutlery, own private braai. 4 double bed bungalows that includes bedding, fridge, air conditioner or water cooler, television, own private braai. Facilities on offer is a restaurant, bar, swimming pool and conference centre. Each camp site with own private braai. When looking out over the harsh and unforgiving landscape, it is hard to imagine oneself standing at the bottom of an ancient lake. True to Namibia, this is a place of contrasts and diversity, with earth's history written clearly in the beautiful rock formations. Explore these remnants of forgotten times. The Camp offers chalets with en-suite bathrooms for those preferring a sense of comfort. 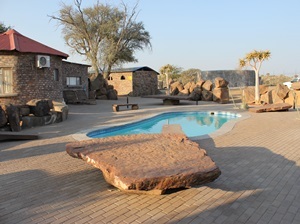 On the farm Spitzkoppe-Ost there are camping facilities with well equipped bathrooms and a kitchen. For those desiring even greater solitude, there is a bush camp in an isolated valley. Catering can also be done on prior arrangement. 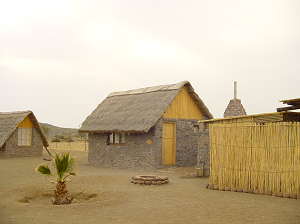 The Quivertree Forest Rest Camp, located on the farm Gariganus just 13 km north-east of Keetmanshoop, offers tourists comfortable accommodation amid a pristine Namibian landscape. On the farm visitors can explore the ancient and famous Quivertree Forest and the dolerite rock formations of the Giants Playground at their leisure. In the afternoons you might be lucky to experience a cheetah feeding.